Only one day after witnessing another honky tonk “Jason,” (Boland) in Saint Louis, I traveled three hours down Interstate 44 to see Jason Eady rock the house at Cartoon’s in Springfield, MO. Eady’s fiancé, Courtney Patton, opened the show. Backed by Eady’s standup bass and pedal steel players, Patton delivered a set full of quiet, deep, and beautiful country songs. Patton gently strummed her acoustic guitar while her soulful vocals filled the room with the high and lonesome country sound that has become all too rare in the new millennium. 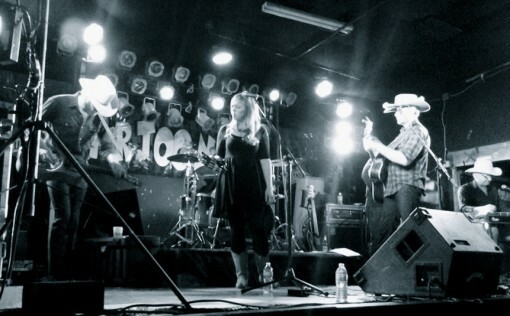 Reminiscent of one of my favorite current artists, Holly Williams, Patton let’s her songs breathe. Patton is unafraid to play slow songs, and her confidence shines while she sings her heart out on the stage. Don Williams should be proud. After joining Patton onstage for a few songs, Jason Eady took the stage next with his full band (which actually included Patton on harmony vocals). Starting off hot with back-to-back honky tonk of “Paying My Dues” and “Old Guitar And Me,” Eady showed that he has firmly placed himself alongside his country heroes like George Jones and Merle Haggard. Next, Eady played a couple songs off of his fantastic new record Daylight & Dark, including “OK Whiskey,” the album’s first single. Patton’s harmony vocals really lifted the songs to a higher level, creating a very full sound on every song. Her presence was especially significant in the duet “We Might Just Miss Each Other,” and the excellent “Man on the Mountain” from AM Country Heaven. Before playing his self-proclaimed country music protest song “AM Country Heaven,” Eady poignantly stated, “Well, we play country music. Here’s a little song we wrote about it.” The crowd at Cartoon’s was in good spirits, and Eady’s true country music sound was a perfect soundtrack to their Saturday night. Eady’s underrated percussive acoustic guitar picking stood out during the intro of “Lonesome Down and Out,” before the band kicked in with an undeniably strong backbeat for one of the best songs on the new album. And just like the album, Eady followed it up with his breathe-taking version of Chris Stapleton’s “Whiskey & You.” Not many people can do Stapleton’s songs justice, but Eady’s soulful country vocals and stripped-down arrangement give Stapleton’s song the authenticity it demands. The end of the setlist contained many songs off of Eady’s 2009 release, When the Money’s All Gone and one gem from his 2007 release, Wild Eyed Serenade. “Judgement Day” sounded great with this current touring band, and the set closer “Back to Jackson,” was explosive. I can safely say it was one of the best closing songs I’ve heard in a long time. I didn’t want it to end. Eady re-entered the stage to play another house-rocker and personal favorite, “God Fearing Blues.” Eady sent the crowd home with his extremely soulful fan favorite “Cry Pretty,” which surprisingly had even more emotion live than it did on the album. After Eady left the stage and fans flocked to the merch table for autographs, “Boys Round Here” by Blake Shelton came on through the loud speakers, and I cried out of sadness and anger. I found peace however, when I became content with the fact that from 9:15 – 12:15 on a Saturday night somewhere in Missouri, roughly 100 people were lucky enough to witness what real, passionate, genuine, soulful, heart-felt, talented, and authentic country music sounded like. Thank you Courtney and Jason. Thank you. Dallas Terry: What has your touring life been like since the release of your first full album? Courtney Patton: Well, I still don’t have a band. I book a lot of listening rooms and acoustic shows. I open a lot of shows for people, especially Jason and the boys, and they sit-in like they did tonight, and they play just to add a little depth to it so it doesn’t feel so bare. That’s what I do full-time. I quit my job last December so it’s been a little over a year I’ve been doing this full time. DT: So what’s that been like? CP: Awesome. I just kind of had this realization one day standing in the kitchen. Jason looked at me and said, “We’ve paid for this house and all of our bills and everything for a whole year.” And he just kind of reminded me, “If you ever want to quit, just realize that you’ve done this for a whole year on music.” I have two kids, so it was pretty big. It was scary to quit that job and give up a paycheck… But it’s worked, and I almost get paid a little better sometimes. DT: Has the reception been well since you released your first full record? CP: Yeah. I mean it’s a mellow record, and it’s a deep record I guess. I’m getting good spins and they like it. CP: Yeah I don’t make excuses for it. The only thing I’ve heard that isn’t positive [about the new record] is, “Well there was a lot of slow songs.” But I don’t apologize from them. DT: Do you have any future plans? CP: I’m writing a lot right now. I’ve probably got half of a record maybe. And when that’s done it’s done. We’re going to start working on a duets record maybe? Maybe do a whole record of that. That’s a project that we’d like to do. So right now I’m just focusing on writing. DT: Do you have any specific influences of how you’ve come to your sound? CP: Don Williams, James Taylor, old Willie Nelson. I love Carole King. She’s mellow, a killer songwriter back in the hippie days, and I grew up listening to that because that’s what my mom listened to. Joni Mitchell’s album Court and Spark, it’s real mellow too. Steve Wariner, ya know, like slow good, waltz-y country. DT: If you could take three albums with you to a desert island, what three would you take? CP: James Taylor’s Greatest Hits Volume One, Willie Nelson – Me and Paul, Crosby Stills & Nash’s first record. Jason Eady: Willie Nelson – Phases and Stages, that’s my favorite all-time, hands down. Merle Haggard – Back to the Barrooms. I don’t know an exact album, but I’d say any sort of Stanley Brothers album collection. DT: You mentioned Phases and Stages, which is a concept record. Is that where you got the idea for your new album? DT: And the Chris Stapleton song, did you want to say anything about that? JE: There’s a YouTube video, the ASCAP songwriter video. That video kind of made the rounds, and the song blew me away, and I just knew I wanted to record it. There’ve been other versions of it, but I don’t feel like anybody treated it with space. I just wanted to do it and really give it space. That was the idea. DT: How’s the reception been at the shows since your new record was released? JE: Well this is only the second week, but it’s been great. It makes for a different show because it’s a more mellow record, so where you play it makes a big difference. If you’re in a listening room it goes over one way, and if you’re in a honky tonk you’ve got to kind of space it out a little more. It’s been great, everywhere we’ve gone it’s been received very well. This is only the sixth or seventh show since the record came out. DT: Your earlier stuff is a lot more folk and blues influenced. Do you feel like you’ll ever go back to that sound? JE: It’s really funny because people think that I took this country turn. Actually, it’s really the other way around. The country thing is what I always did. That’s what I grew up listening to, that’s what I always knew I would do. Those first two or three records were really the exception. They were me trying something else, trying something new. It’s just where I was in my life at the time. I had been playing country music my whole life. I just decided I wanted to try to write some different kind of songs. With AM Country Heaven, I just came back to it. But I don’t know if I’ll ever go back [to my earlier sound]. I love writing those kind of songs, I’d love to write them and maybe have other people record them, but I think I’m going to stay with the country thing. DT: You have a very percussive style of acoustic guitar picking. How did you come to that style of playing? JE: The first guy that taught me to play guitar was this 80-year old black blues guy from Mississippi, and it was literally on his back porch. He used to play with B.B. King and all those guys. His name was J.C. Cannon. He worked in the little small town I lived in. I’d go over there, and he played like that. He had a big long thumbnail, and he’d play the bass note and fingerpick and do all that. That was the very beginning of someone teaching me how to play. Before that I taught myself chords and stuff. But this guy, he was the first guy to go “Do this.” Then after that, I put my guitar down for about eight years because I joined the Air Force and started working, and I just sort of gave it up for a long time. And so I always had a guitar around, but I never had picks ever, so I’d just grab the guitar and play. Then over those eight years I just forgot how to play the guitar with a pick, it just became normal to play without it. So now if I use a pick it’s horrible. It’s like a five year old, real clanky and no finesse at all. DT: Lastly, what has it been like touring through the Midwest. You just got finished with four dates in the Missouri, how was that? JE: I love it up here. I really do. For some reason when I started touring, I did East coast and West coast, but the Midwest is really where it seemed to connect. Being outside of Texas, it was even more than the Southeast or any of those areas. Man, I’ve been coming up and playing Kansas City and Saint Louis for about as long as I’ve been playing Texas really. posts here in the early hours in the morning, as i like to gain knowledge of more and more. Wow, marvelous blog format! How lengthy have you been blogging for?you make blogging look easy. The entire glanceof your web site is fantastic, let alone the content! I simply want to tell you that I am just newbie to blogs and absolutely liked you’re web page. More than likely I’m want to bookmark your blog post . You really come with awesome article content. Kudos for sharing your web site. I would like to thnkx for the efforts you’ve put in writing this website. I am hoping the same high-grade site post from you in the upcoming also. Actually your creative writing skills has inspired me to get my own web site now. Actually the blogging is spreading its wings fast. Your write up is a great example of it. I would like to show my appreciation to this writer just for bailing me out of this circumstance. Just after looking through the world wide web and coming across opinions that were not powerful, I believed my life was over. Existing minus the answers to the difficulties you have resolved by means of your good website is a serious case, as well as ones which might have in a wrong way damaged my career if I hadn’t encountered your web site. Your actual natural talent and kindness in handling all the pieces was priceless. I’m not sure what I would have done if I had not come across such a thing like this. I’m able to at this point relish my future. Thanks for your time very much for your skilled and results-oriented help. I won’t hesitate to refer your blog post to any individual who desires assistance on this problem. hey there and thank you for your information – I have definitely picked up something new from right here. I did however expertise a few technical issues using this site, since I experienced to reload the site a lot of times previous to I could get it to load properly. I had been wondering if your web hosting is OK? Not that I am complaining, but sluggish loading instances times will sometimes affect your placement in google and can damage your quality score if ads and marketing with Adwords. Well I’m adding this RSS to my e-mail and could look out for much more of your respective exciting content. Make sure you update this again very soon.. Very good written information. It will be helpful to anyone who utilizes it, as well as me. Keep up the good work – i will definitely read more posts. I’m just writing to let you know of the impressive encounter my wife’s girl went through browsing your web page. She realized several details, most notably what it’s like to have an awesome teaching spirit to make others without hassle gain knowledge of a number of tricky subject areas. You really exceeded my expectations. Many thanks for rendering those helpful, trustworthy, educational as well as fun tips on this topic to Janet. It is really a great and useful piece of info. I am glad that you just shared this useful information with us. Please keep us informed like this. Thanks for sharing. Dallas Terry is located hundreds of miles away from the epicenter of Texas/Red Dirt Music. This feature finds him taking in concerts by scene favorites at fresh venues and with audiences outside the homebase market of your Texas/Red Dirt favorites.